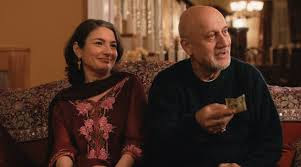 This acclaimed comedy is based on the real-life relationship and culture clash between comedian Jumail Nanjiani and his future wife, Emily Gordon. When Emily contracts a mysterious illness, Kumail has to force himself to face her feisty parents, temper his family’s expectations, and follow his heart. When I first heard of The Big Sick, I thought that it was going to be another sappy, sad, woman-has-mysterious-disease-and-might-die movie. I wasn’t really interested in seeing it because I don’t do well with sick people movies. But, when I was offered the movie for review, I thought that at least I was in my own living room, and could turn it off if it got to be too much for me. The exact opposite happened. I found myself giggling throughout, even during the more serious parts. Kumail is a stand-up comedian in a Chicago club trying to make it, and one night, Emily is in the audience. After a small heckling moment, Kumail approaches Emily and starts chatting with her. Kumail takes Emily home and from there begins a fun relationship between the two of them. As time passes, Kumail is afraid to tell his parents about Emily and just goes along with his family’s expectation that he will go to law school, enter into an arranged marriage with a Pakistani woman, and give up comedy. Emily, however, has told her parents about Kumail and wants him to meet them. After Emily finds out the Kumail hasn’t told his family about her and finds his box of arranged marriage options, she leaves telling him to never call her again. Later, Kumail receives a call from a friend of Emily’s asking him to go sit with her in the ER because no one else can. When he arrives, he is told that Emily’s condition is more serious than a cold, and at the doctor’s urging, he pretends to be her husband so that the hospital can perform a procedure on Emily. Turns out, she needs to be placed in a medically –induced coma. Kumail calls her parents, who immediately get on a plane. When they arrive, the awkwardness begins, as they have heard all about Kumail and Emily’s break up. They don’t want him at the hospital, but he stays anyway, and ends up getting to know her parents. Kumail and Emily’s parents disagree somewhat on Emily’s treatment when her parents want to move Emily to another hospital. Kumail insists on keeping her where she is because moving her could be dangerous. After some thought, they leave her where she is. Kumail arrives at the hospital and Emily has awakened. When he parents leave the room, Emily tells Kumail that she doesn’t want to see him anymore and asks him to leave. When Emily is released from the hospital, her parents throw a welcome home party for her and his mother invites Kumail. He arrives and Emily is not happy that he’s there. But he talks to her and shows her everything he’s kept from the time she entered the hospital and shows her he loves her. He also tells her that he’s moving to New York. In New York, Kumail is once again performing a show at a comedy club, when someone heckles him. He sees that it’s Emily and their relationship is renewed. I was surprised when I read that Judd Apatow was one of the producers of this movie. Usually, his films are more in-your-face, and gross. I was pleasantly surprised that this wasn’t one of his typical movies and really liked the story. Kumail really told his story and made everyone fall in love with him and Emily. Zoe Kazan was great as Emily and she really resembled the real Emily. 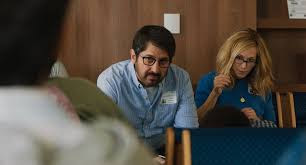 I thought that Holly Hunter and Ray Romano were perfectly cast as Emily’s parents and I loved the awkwardness in their relationship and the awkwardness between them and Kumail. The Big Sick is a great autobiographical story and it left me wanting to know more about Kumail and Emily. The Big Sick is presented in 1080p high definition widescreen and is really good. The picture is clear and colors are great. The transition between scenes is great, with no issues. The picture really popped on the screen and I enjoyed watching it. The Big Sick’s English 5.1 DTS-HD Master Audio was really good, as well. The volume was even and at a good level, with no adjustments needed. Dialogue was easily heard, even at the lower moments. Audio is also available in Spanish 5.1 Dolby Digital with subtitles in English SDH and Spanish. I really enjoyed watching the special features. After watching the movie, I wanted to know more about Kumail and Emily’s relationship and these features provided more insight. A Personal Journey: The Making of The Big Sick (14:49): A talk with the cast and crew about the movie. The feature gives the background on Kamail and Emily’s real relationship and how they wrote the script together. The Real Story (7:11): Kumail and Emily’s real story told by Kumail and Emily. Watching this feature really shows how much they are in love and how much fun they have together. 2017 SXSW Film Festival Panel (11:32): A chat with the cast and crew at the SXSW festival this past spring. The Big Sick: The Other Stuff (3:47): A few deleted vignettes from the movie. Not long enough to be deleted scenes, but still worth putting in the features. This was pretty funny. There were a couple of bloopers that made me laugh. Deleted Scenes (10:06): Eight deleted scenes available individually or as play all. The Bigger Sick: Stick Around for More Laughs (10:25): A view of The Big Sick Comedy Tour. I was pleasantly surprised that I enjoyed The Big Sick as much as I did. It’s a sweet love story that kept me giggling and made me fall in love with the characters. It’s definitely one that I will keep on my shelf and watch again and will probably get funnier as I catch more of the jokes. It’s a good date night movie, or a night in with your girlfriends and a bottle of wine.